This was a made-for-TV vehicle for Kelsey Grammer to play the reluctant heir to the Santa Claus dynasty, which of course means a large portion of the movie showcased him morphing into the role. We've been here before, of course. Call Me Claus and The Santa Clause both featured a character transforming into the archetype, and both Snow and Arthur Christmas did the same with the added caveat that the job stayed in the family. It's certainly not a unique idea. Of the movies I just mentioned, the one this feels most similar to is The Santa Clause, though there are quite a few differences. It's worth noting that the Santa Clause 2 came out the same year as Mr. St. Nick, and both movies involved the main character needing to find a Mrs. Claus. It's hard to look at Mr. St. Nick and not see it as a rip off of Tim Allen's franchise in some ways. But it's even harder to find an aspect that isn't superior. 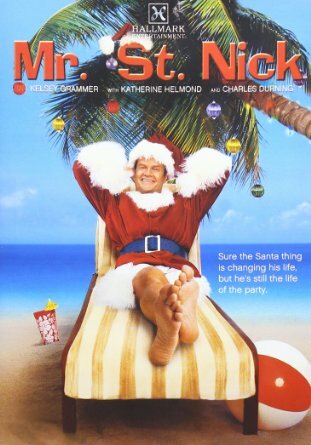 While Mr. St. Nick isn't a great movie by any stretch of the definition, it's solidly decent. More than that, it offers a handful of elements that are both impressive and rare. The story starts at the North Pole, where the elder Santa, played by Charles Durning for neither the first nor last time, is rehearsing the ceremony to hand the torch over to his son. Present is a wizard, played by Wallace Shawn (the great Vizzini himself). While a handful of the costumes and dialogue are played for laughs, there's an underlying sense of solemn mystery here. I'm wracking my brain trying to think of a better live-action North Pole that incorporates elements of fantasy and pagan imagery, and I'm drawing a blank. They run into an issue immediately: the St. Nick next in line didn't show for the ceremony. Instead, he's partying at his mansion in Miami. Santa stops time and teleports him to the North Pole to demand he take his responsibilities more seriously. They never really delve into these two powers, but together they imply some thought behind the annual deliveries. The two fight, with the younger Nicholas telling his father he doesn't want the job, and the elder deciding to keep it. Nick St. Nicholas is sent back to Miami. Oh, yeah. That's his name, it's dumb, get over it. It's better than Nicholas St. North. He returns to what he was doing, flirting with a TV weather woman half his age. She reciprocates his affections and convinces him to put together an online charity collecting donations for the needy. Only, unbeknownst to Nicholas, the charity is a con, and the money's being pocketed by his new girlfriend and her lover. Meanwhile, his butler (who's secretly an elf) hires a new cook, who's a Venezuelan immigrant working on a visa. She gets almost as much screen time in this as Grammer, and (not surprisingly) eventually wins his affections. But that's not until after he becomes engaged to the femme fatale weather woman. Oh, and he starts manifesting the powers of Santa Claus, though he doesn't figure out why. Turns out, it's because nature has laws that aren't tied to family spats or what either St. Nick wants. While he starts gaining his abilities, his father loses his power. Obviously there's a reconciliation in the end, he gets together with the cook, and the villains are captured. I'd actually hoped they'd get away with the money - it would have been a poignant twist to have St. Nick realize he didn't care about revenge or even justice, that he could do more than enough good with his magic and legacy to make up for what they'd taken, and that he'd just as soon see them happy together. But I suppose that would have been a tall order, and you can't get everything you want. The movie's third antagonist actually fared a little better. There was an overzealous, slimy immigration agent who harassed the cook and - by investigating her employer - came across the stolen money. He was a bit out of place in this, playing an over-the-top, cliche jerk in a movie that featured otherwise relatively nuanced characters. Despite the fact his motives were never pure, Nicholas hand delivered his ex-fiance and her crooked business partner to him. Like I said, this wasn't a great movie. There were several dull stretches while we waited for the evil fiance to reveal her true nature. But the cast were generally strong, and the writing was solid enough to sell both the love story and father-son relationship. I wouldn't recommend this to everyone, but it's a movie that sets out with a similar premise to The Santa Clause, a film some people still consider a classic, then delivers a vastly superior product. If you're enough of a Santa nerd, this offers a good variant on the fantasy version of the character. That's unusual enough, especially in live action, to make it stand out.